Hydraulic-setting, highly flexible,consumption and for handling optimized, dust reduced powder adhesive with lightweight fillers. SCHÖNOX Q6 fulfills the requirements for flexible mortars according to the guideline of Deutsche Bauchemie. SCHÖNOX Q6 generates because of modern raw materials and innovative production technology approx. 90%less dust while mixing. 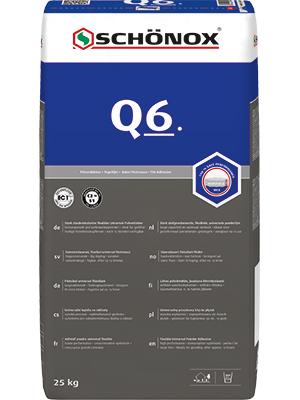 SCHÖNOX Q6 all-purpose suitable with the thin-bed, mid-bed and thick-bed method on walls and floors. Applicable as pourable mortar on floors.